I wrote about this panzanella here. It’s a total gem, star-of-the-winter kitchen, keeper. I’m not sure that it will ever rate high on the ‘man-food’ scale, but they will learn to like it. Take it from the woman who turned her ultimate carnivore partner into a chickpea eating glutton – they will learn to like it. 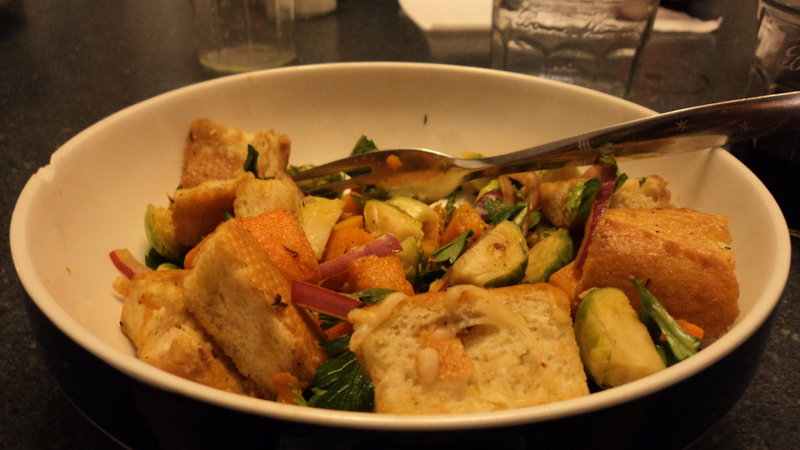 The recipe is adapted from Smitten Kitchen’s adaptation of Michael Chiarello’s Roasted Vegetable Panzanella. Smitten’s is great, but I’ve made a few changes to make this accessible in the kitchen of any harried working parent (or otherwise time-pressed adult). *All herbs/spices on the list are listed as fresh in Smitten’s recipe, but I used dried for everything except the parsley. Once you taste this you will realize that the fresh parsley is crucial. Feel free to sub out anything else. Cut bread into small cubes. In a large frying pan, melt butter. Add bread, garlic, thyme and most of the grated cheese. Toss around until they are covered and good and toasty. Transfer to a large backing sheet and cover with remaining cheese. Stir once or twice. Bake for 10-15 minutes until crisp and light brown. Place aside to cool. Slice onion and place in vinegar. Set aside for 15 minutes. Empty bag of squash onto a large baking sheet. If cubes are big, cut in half or thirds until they are roughly equal in size. Toss with evoo, s &p, and sage. Place in oven. Rinse, trim ends and quarter brussels sprouts. Place on large baking sheet and toss with evoo and s&p. Place in oven. Watch carefully for 15-20 minutes. Sprouts will finish first, and are done when they are still firm, but fork-tender. Squash takes a bit longer. Once sprouts are out, start dressing. Add a bit (1/8-1/4 cup) evoo to onions and vinegar. Whisk up and have ready. Once squash is done empty vegetables, parsley and bread into a bowl. Toss and remove a bowl for any child or adult who prefers no dressing. Add dressing and toss. Garnish with parmesan if desired and serve. The croutons are the perfect crunchy, cheesy contrast to the warm and firm roasted vegetables, and the parsley and vinegar add a punch of brightness.